Ford is interested in exploring what can result in sketching cars in virtual reality. Ignore the rollaway chairs, seat cushions, back rests, travel pillows, the lot. Industrial designers can put on their headsets, stand, burn calories, and fire up their minds with new ideas for new models. Those who are exploring VR at Ford are getting familiar with a special work experience. Rather than sketching in traditional ways, this process involves interesting results. Roadshow Jake Holmes was one of several car watchers who reported on this new medium twist for automotive designers. Enter Michael Smith, design manager, Ford Motor Company. Smith showed what this is all about, via a 3-D rendering of a wild racing car concept (not for production in the real world but the point was definitely made). The work took him just a little less than two days (40 hours). Traditional design methods at Ford would have taken him months to do the same. "Designers trade in their sketchpads for a headset and controllers to become immersed in virtual reality," a Ford release said. They imitate gestural interactions through motion tracking, replicating sketching with pen and paper. How useful was it compared with a traditional route of 2-D sketches and CAD? Holmes could answer that. The sketch had "a fully realized exterior and interior, as well as incredibly detailed mechanical components: pushrod-style suspension, a hybrid powertrain and even details like intercoolers and turbocharger piping." The technology in focus involved the VR program Gravity Sketch. The latter, a 3-D VR tool, is a software program but Ford worked with the software maker to customize it, into a "Ford" version. Oluwaseyi Sosanya is Gravity Sketch CEO. So, will we see cars in showrooms designed by Gravity Sketch any time soon? For Ford, its use is in the experimental stage, involving about 40 to 50 Ford employees worldwide. Holmes quoted Smith: "Think of this as prototypical of how we might operate in the future." Smith said they are operating on human scale; they are designing on human scale. The vehicle is one to one." It becomes key to prototype the kind of experience the customer is going to have. "In the scale-free nature of VR, you can play with the world, allow it to speak to you and your design." Ford designers spend about 8 hours to get up to speed on Gravity Sketch, Smith said in Roadshow. When one hears the word "sketch" something casual comes to mind, a hasty rendering in a pencil of what the person has in mind for later versions until a final. In the Ford initiative, however, working in Gravity Sketch is revealing advantages beyond just speeding up a design process. Smith understands how the designer's head works. Designers, he said, love to noodle. They like to delete. They like to start all over. The video shows designer-in-motion, wearing a headset, engaged in a swirl of curves and lines. "I can do things I can't do in real life," Smith said in Roadshow. "I can be sitting in the model and have my head sticking through the surface." Genevieve Scarano in Geek.com: "During Gravity Sketch's process, a designer can anchor a mock driver at the center of their design, and rotate their 3-D design to create a scalable automobile around the mock driver. If more adjustments are needed, they can even step inside the 3-D sketch without an issue, as long as they're wearing the VR headset." Designers can create complex curves; they can view the total look from multiple angles; they can manipulate shapes in ways that were not possible with techniques like clay modeling. 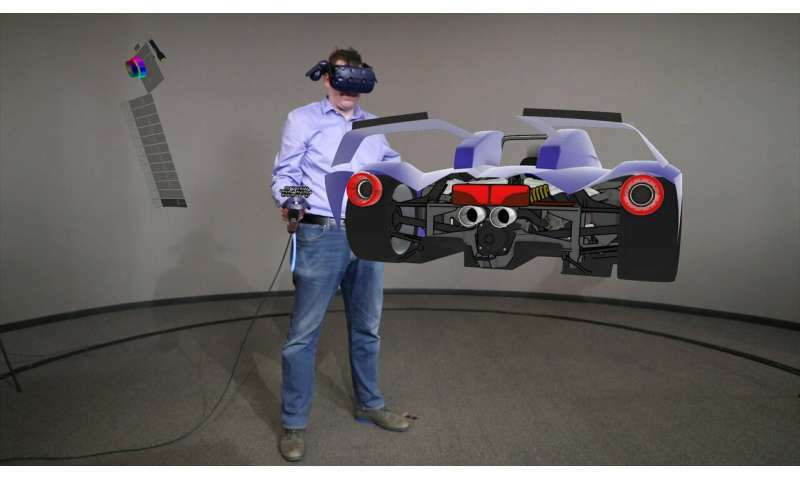 Cadalyst explored the advantage of the VR interface for those creating big objects—such as cars. This is the ability "to enlarge the model and place themselves next to or inside the vehicle while they work, getting a better sense of scale, proportion, and what the end-user experience will be like." "Each design can be rotated through 360 degrees and perfected by stepping inside each 3-D model to get a sense of how the car will look and feel – helping to place the customer inside the vehicle from the very start of the design process," said Car Keys. "When a stylist sketches out a new car concept in two dimensions, for example, the next person in the chain has to start from scratch to create that design in a CAD application, using the drawings for visual reference only—a process that can take as long as three weeks, said Sosanya, and some of the original designer's intent may be lost in the translation. With Gravity Sketch, which is parametrically based and preserves all the points in the concept sketches, users can "preserve the sketch from stylist all the way through pipeline" instead. The Gravity Sketch site points out that users create the foundation of their designs Gravity Sketch and then can take such designs on to popular CAD software for further development via .iges export. The latter stands for Initial Graphics Exchange Specifications. As for the Ford environment, Holmes explained that "The system can also be fully integrated with any of Ford's other design methods: importing sketches, exporting to CAD files and so on." It's not a question of mind versus bodies with headsets; it is more an answer to thinking with one's whole being. Cadalyst talked about the mind-body exchange when someone is at work on design. "When they're struggling to communicate an idea or make a point, many people automatically start 'talking' with their hands...physical movements can help the speaker define their own thoughts, as well as share them with others. And using the hands to mime actions, indicate subjects, and even sketch pictures in the air is such a natural impulse that many speakers don't even realize they're doing it."